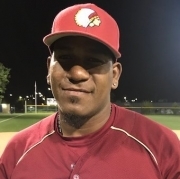 Johnny Welch’s single in the bottom of the seventh inning scored pinch-runner Erick Ramirez with the winning run when the Chiefs walked off with a 3-2 win over the Somerville Royals at Maplewood. Danny DiMare’s two RBI’s had given the Chiefs a 2-0 lead until a Ryan Hood two RBI double tied the game up in the top of the seventh. Tim Dunphy (2-1) got the win while Chris Ramos (0-3) took the loss. Chris Hopkins had a homer and five RBI’s and John Jennings hit his fourth round-tripper of the year to lead the Americans to a 8-2 win over Alibrandis in Melrose. Kyle Autilio (4-3) went 4.1 innings to record the win. In Lexington, veteran Matt Karis (2-1) tossed six innings of shutout relief to get the win when the Blue Sox knocked off the Wakefield Merchants 11-1. Bobby Losanno’s leadoff homer gave the Merchants a 1-0 lead in the first inning. Chris Bosco’s single scored Joey Hodapp in the bottom of the eighth inning with the game’s only run when the Reading Bulldogs beat the Malden Maddogs 1-0 at Endicott College. Jack Burke (4-0) went the distance and allowed only three hits and struck out 12 batters. Kendall Chaves (0-2-1) was almost as good for the Maddogs giving up just five hits in the tough loss. The Lexington Blue Sox took both ends of a doubleheader in Reading, winning the opener 8-0 and then taking the nightcap over the Bulldogs 6-2. 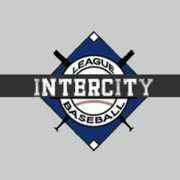 Alsis Herrera (1-0) threw five shutout innings and Dorian Rojas drove in three runs in the first game. Julian Alvarez homered and Taylor Ferguson had a double and two RBI’s in the second game. Casey Bussone (3-1) went five innings to get the win and Kevin Scanlon chalked up the two inning save. The Somerville Royals and Watertown Reds split a pair at Victory Field. The Royals won the first game 4-2 behind the three-hit pitching of Ryan Covelle (3-1). Brady Chant led the way with four hits and Jake Cintolo and James McConville added a couple of hits each for the Royals. The Reds rebounded to grab game two 5-1. In Wakefield, Evan Walsh (4-3) allowed just two earned runs and six hits when the Andre Chiefs edged the Merchants 4-3. Ben Waldrip had four hits and two RBI’s and Tony Serino, with three singles, led the Chiefs offense. Ryan Collins had two of the Merchants hits as Andrew Auld (0-1) took the loss. Alibrandis got two doubles from Gordie Gronkowski, and two hits each from Dave Lightbody, Juan Parra and Bobby Barrett, to walk off with a 4-3 win over the Watertown Reds at Ferullo Field. Brian Tanguay (2-1) came on in the seventh inning, in relief of Lew Jensen, to pick up the win. In Lexington, the Blue Sox broke a 2-2 tie when they scored twice in the bottom of the sixth inning and went on to beat the Melrose Americans 4-2. Richie Burgos’ double gave the Sox the lead. Manny Delcarmen recorded two K’s in the seventh to record his second save in relief of Drew Leenhouts (3-1) who got the win. The Wakefield Merchants shut out the Malden Maddogs 5-0 at Maplewood. Joseph Maguire (pictured) went the route when the Merchants turned back the Reading Bulldogs 6-4 in Wakefield. Paul McGunigle had a double and three RBI’s and Bobby Losanno added two hits for the Merchants. Zac Talis and Johnny Hayes both had a couple of hits for the Bulldogs. Maguire raised his record to 5-2 on the season. Cam Lanzilli (1-3) went the distance for Reading. Justin Silvestro and Taylor Ferguson both belted grand slams to lead the Blue Sox to a 12-0 win over the Malden Maddogs in Lexington. Morgan Brown, who had three hits, cleared the bases with a double in the sixth. Mike Geanellis (1-1) went five innings, allowing four hits, to record his first win. In Melrose, Mitchell Clegg (2-2) went the distance, striking out nine, to get the Andre Chiefs past the Americans 5-3 at Morelli Field. Tony Serino (2), Shande Stande, Leivi Ventura, and Johnny Welch, with a solo homer, had the Chiefs’ RBi’s. Chris Hopkins had three hits and Dave Center, Malcolm Nachmanoff and John Jennings two hits each for the Americans. Chris Mitchell (3-2) allowed only two earned runs in 6.2 innings but took the loss. Alibrandis scored a couple of runs in the top of the seventh to come from behind and beat the Somerville Royals 5-4 at Victory Field. Sean Sullivan and Lamarre Rey (2-0) combined on the win. Edaurdo Soto and Rob Caggiano had three hits each for the Royals who outhit Albrandis 10-4 in the game. Chris Ramos (0-2) suffered the loss in relief of Paul Covelle who worked the first six innings. Evan Walsh evened his record at 3-3 and Leivi Ventura (pictured) hit his fifth homer of the season, a fourth inning grand slam, to lead the Andre Chiefs to a 10-2 win over the Malden Maddogs at Maplewood. Matt Nuzzo had a single, double, and two RBI’s and Johnny Welch had three hits and scored three runs for the Chiefs. Shane O’Halloran had three of the Maddogs’ seven hits. Blaine McLean (1-4) took the loss. Julian Alvarez’ bases-loaded infield single scored Nate Wolf with the winning run when the Blue Sox walked off for the fourth time this year in a 3-2 win over the Reading Bulldogs in Lexington. Wolf gave the Blue Sox a 2-1 lead in the third with his first home run of the summer. Jeff Roy tied it in the sixth for Reading with his first home run of the season. Borja Jones-Berasulce (1-1) retired all four batters he faced, two on strikeouts for the win in relief. In Watertown, the Reds scored seven times in the bottom of third inning and went on to beat the Wakefield Merchants 8-2 at Victory Field. Nate Beck (2-2) scattered four hits, with help from Mike Wesoloski, who worked the seventh. Taylor Ferguson and Justin Silvestro each drove in two runs in a five run third inning when the Lexington Blue Sox beat the Andre Chiefs 5-2 at Maplewood. Nick Godfroy (2-2) earned the win tossing two innings in relief of Drew Brzozowski. 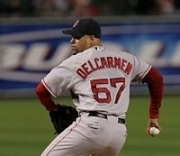 Former Boston Red Sox right-hander Manny Delcarmen pitched out of a bases loaded jam in the bottom the sixth and earned the five out save. Johnny Welch, with his fifth home run, and Kyle Dembrowski with a pinch-hit single, drove in the Chiefs’ runs. Tim Dunphy threw four innings of scoreless ball in relief of Jared Freni (3-2) who took the loss. The Wakefield Merchants-Melrose Americans game at Morelli Field was postponed due to wet grounds. 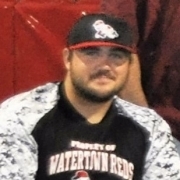 Steve Tramontozzi’s bases loaded walk-off single in the bottom of the seventh inning completed the Reds’ comeback and carried them to a 3-2 win over the Lexington Blue Sox in Watertown. It was a night of Lucky 7’s for Matt Horan, who went the seven inning route, earned his seventh straight win, improved to 7-0 on the year, allowed seven hits, and struck out seven. Will Brennan, with two hits, and Jake Miller, had the other RBI’s for the Reds. Taylor Ferguson homered for the Blue Sox in the third inning when they took a 2-0 lead. Nick Godfroy (1-2) took the loss in relief of Alsis Herrera and Borja Jones-Berasaluce, who came on in the fifth inning. The Alibrandis-Reading doublehaeder and the Malden-Somerville games, scheduled earlier in the day, were both postponed due to rain. Chris Hopkins went 3 for 3, and the Melrose Americans got a couple of hits each from Dan Cacciola, Kyle Cortese, and Mike Goddu, as well as a two RBI single from Dave Center, to beat the Blue Sox in Lexington 6-2. Shawn Smeglin (2-2) pitched 4.2 innings, allowing just four hits, to earn his second win. Aran Hamilton-Grenham threw 2.1 innings of no-hit ball to earn his third save. Matt Karis (1-1) took the loss. Alibrandis scored four times in the bottom of the sixth inning to come from behind and beat the Malden Maddogs 7-5 at Ferullo Field. Teddy Dziuba led the way at the plate with a double and three RBi’s and Bobby Barrett added three hits for Alibrandis. Bryan Saffelle (1-0) got the win in relief of Brian Tanguay and James Cramphin recorded the save. The Reading Bulldogs scored five times in the top of the eighth inning, breaking a 2-2 tie, and went on to a 7-3 extra inning win over the Melrose Americans at Morelli Field. The Bulldogs got a homer, two hits, and two RBI from Chris Bosco (pictured), and three hits from Tyler Cedeno, to lead the 14 hit attack. Malcolm Nachmanoff homered and Dave Center had three hits for the Americans. Ben Gottesman (2-0) got the win with two innings of relief. In Thursday’s other game, the Wakefield Merchants edged Alibrandis 7-6 at Ferullo Field in Woburn. Johnny Hayes’ fifth inning double proved to be the big hit when the Reading Bulldogs came from behind to edge the Andre Chiefs 4-3 at Maplewood. Jack Burke (3-0) went five innings to get the win while Cam Lanzill threw two perfect innings to record the save. Homers by Leivi Ventura and Johnny Welch gave the Chiefs a 3-1 lead in the fourth. Mike Gedman (0-1) pitched well, going five innings and allowing five hits, but took the loss. Tyler Cedeno, Chris Bosco and Jeff Roy had RBI’s for the Bulldogs in the win. 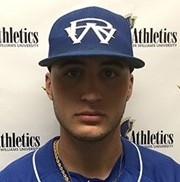 Mike Andrews got the complete game win when the Merchants erased a 2-0 sixth inning deficit to walk off with a 3-2 win over the Somerville Royals in Wakefield. Ryan Collins and Scott Searles (2) delivered the late inning RBI’s for the Merchants. A solo homer from Brady Chant and an RBI double from Jake Cintolo gave the Royals the lead. Andrews (3-1) allowed five hits and struck out seven. Paul Covelle (2-2) took the loss despite striking out 11. At Morelli, the Watertown Reds used a complete game four-hitter from Nate Beck, and got a homer and four RBI’s from Dan Chaisson (pictured), to turn back the host Melrose Americans 9-1. Beck (1-2) struck out eight. For Chaisson it was his third home run of the season. Kyle LaVigne, Jake Miller and Bryan McGrath added two hits each for the Reds. Dan Cacciola had two of the Americans’ four hits.